In the courts opinion (the three judges Cortinas, Rothenberg and Schwartz, Schwartz gave a dissenting vote), in essence stated in this case that the repair station, the lien holder must have had possession of the aircraft at the time it placed the “Mechanic Liens” on an aircraft. 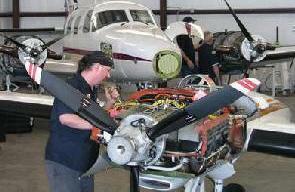 If a mechanic and or repair shop should release an aircraft after it has undergone repairs, with the understanding that the bill will be paid at a later date and should the payment of services become delinquent, and a Mechanic Lien placed on the aircraft, the court has said it is non enforceable. Obviously, this poses a problem due to a common practice of aircraft owners generally pick up their aircraft when the repairs are completed and the repair station mails out the bill. The final bill may not be received until after the mechanic and or repair shop gets its final bill (s) from it venders (e.g. equipment overhauls). Commercial Jet, the maintenance shop plans to file a motion for rehearing (en banc) En banc, in banc, in banco or in bank is a French term (meaning "on a bench") used to refer to the hearing of a legal case where all judges of a court will hear the case (an entire "bench"), rather than a panel of them. It is often used for unusually complex cases or cases considered of unusual significance. Appellate courts in the United States sometimes grant rehearing en banc to reconsider a decision of a panel of the court (a panel generally consisting of only three judges) where the case concerns a matter of exceptional public importance or the panel's decision appears to conflict with a prior decision of the court. In rarer instances, an appellate court will order hearing en banc as an initial matter, instead of the panel hearing it first. Some appellate courts, such as the Supreme Court of the United States and the highest courts of most U.S. States, do not sit in panels, but hear all of their cases en banc (with the exception of cases where a judge is ill or recused). Below is the brief case outline and opinion by the court. Commercial Jet, Inc. (Appellant), vs. U.S. Bank, N.A.(Appellee). No. 3D10-619. Court Of Appeal Of Florida, Third District 2010 Florida. App. LEXIS 13618 September 15, 2010, Opinion Filed. Notice: Not Final Until Disposition Of Timely Filed Motion For Rehearing. PRIOR HISTORY: [*1] An Appeal from the Circuit Court for Miami-Dade County. Lower Tribunal No. 09-49406. Scott J. Silverman, Judge. Counsel: McDonald and McDonald and David M. McDonald, for appellant. White & Case and Stephen M. Corse, and Rachel Sullivan, for appellee. Judges: Before Cortinas and Rothenberg, and Schwartz, Senior Judge. Rothenberg, concurs. Schwartz, Senior Judge, (dissenting). Opinion By: Cortinas. Commercial Jet filed this action to foreclose a purported mechanic's lien on a Boeing 767 aircraft for which it had provided maintenance and repairs. Despite an outstanding balance, Commercial Jet returned the aircraft to Silver Jet, its operator, which put it back into service. After it relinquished possession of the aircraft, Commercial Jet recorded a claim of lien under sections 713.58 and 329.51, Florida Statutes, for the unpaid balance against Silver Jet and U.S. Bank, the aircraft's owner. Since the purported lien is a possessory lien under section 713.58, and Commercial Jet was no longer in possession of the aircraft at the time it filed the lien, the trial court granted U.S. Bank's motion for summary judgment. We affirm the trial court's order and reject Commercial Jet's argument that section 329.51 [*2] modifies section 713.58 by eliminating the requirement that one must have possession of the property in order to claim a lien. Section 713.58 creates a lien "[i]n favor of persons performing labor or services for any other person, upon the personal property of the latter upon which the labor or services is performed . . . ." § 713.58(1), Fla. Stat. (2009). This lien exists only as long as the person entitled to the lien retains possession of the property upon which the lien is claimed: the statute expressly provides that "the possessory right and lien of the person performing labor or services under this section is released, relinquished, and lost by the removal of such property. § 713.58(3), Fla. Stat. (2009). Therefore, there is no question that the lien right afforded by section 713.58 is possessory in nature and that a repairman's right to claim a lien under section 713.58 is extinguished when he relinquishes possession of the property on which the lien is asserted. Commercial Jet agrees that section 713.58 "has been interpreted to" require possession but argues that section 329.51 amended section 713.58 by providing that a valid lien can be created simply by recording a claim of lien within ninety days. However, section 329.51 does not create any new lien rights. Instead, it is manifestly a notice statute, as is apparent by its title ("Liens for labor, services, fuel, or material expended upon aircraft; notice"), and it specifically states that it applies to "[a]ny lien claimed [*4] on an aircraft under s. 329.41 or s. 713.58 . . . ." § 329.51, Fla. Stat. (2009) (emphasis added). Section 329.41 creates a lien right for fuel furnished to aircraft; section 713.58 creates a lien right for labor or services performed on aircraft and other personal property. Section 329.51 details how, once a fuel or service provider acquires a lien on an aircraft pursuant to section 329.41 or 713.58, he may perfect his lien and establish priority of enforcement as it relates to third parties. Thus, section 329.51 has no application here because Commercial Jet never acquired a valid lien under sections 713.58 or 329.41. As Commercial Jet did not have possession of the aircraft when it attempted to claim a possessory lien under section 713.58, it cannot proceed in its attempt to foreclose on the purported lien. Therefore, we affirm the trial court's grant of summary judgment in favor of U.S. Bank. Section 329.51, Florida Statutes, 1 clearly provides that a lien for repairs on an aircraft such as the one in this case is perfected simply by recording a claim of lien within ninety days of the services rendered, [*5] as the appellant did in this case. The majority holding that following that provision did not have the effect specifically provided by the legislature is in conflict with just about every canon of legislative interpretation there is, including: that statutory words must be accorded their plain meaning; that every statute must be deemed to have some meaning and accomplish something (here, the court's ruling renders the filing of the lien of no effect whatever); that a statute dealing with a specific subject, such as aircraft, must be deemed to control over a general one such as section 713.58, which applies to all personal property, and no doubt other general rules which no one has thought it necessary to devise--until now. 1 Section 329.51, Florida Statutes (2009), provides: Any lien claimed on an aircraft under s. 329.41 or s. 713.58 is enforceable when the lienor records a verified lien notice with the clerk of the circuit court in the county where the aircraft was located at the time the labor, services, fuel, or material was last furnished. The lienor must record such lien notice within 90 days after the time the labor, services, fuel, or material was last furnished.